By Loree Hazelrigg – A team of students was chosen from William Jewell to attend the University Innovation Fellowship Meet-Up at Stanford University in Palo Alto, California. 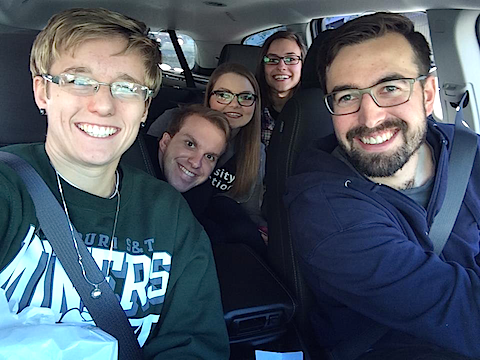 This team consisted of Bradley Dice, James Milam, Amelia Hanzlick, Conner Hazelrigg, and Kate McFerren, while Landon Young was the faculty advisor. Before arriving at Stanford University, William Jewell Students teamed up with other schools and toured Google’s campus. While there they participated in small creativity workshops and listened to panelists talk about ways in which their experience at Google has helped them with their individual endeavors. The panelists discussed how Google employees address product development with a “Moon Shooting” mindset. The three criteria they have when developing a new product: Must be solving a problem, the solution must seem impossible, and must be utilizing breakthrough technology. The students also worked in small groups defining problems, identifying consumers and brainstorming solutions. They were told to use the Google method of solving problems: define the problem, think of possible outcomes, come up with a prototype and test. Google has an extreme bias towards action. One panelist said that Google will make 10 prototypes per week that fail, but as a company they are quite obviously succeeding. Google employees celebrate failed products because each failure gets them closer to a successful solution. The William Jewell students who had this experience have been taught that failing does not make you a failure, but rather it gives you knowledge to find a solution. Experiences like this one have driven the William Jewell team of students to expand their thinking to solve problems and innovate for the future. 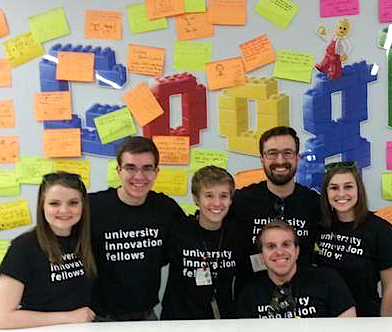 Student Bradley Dice leads the University Innovation Fellowship project at William Jewell.